Firstly I can’t let another day go by without mentioning the gorgeous weather we’ve been having , of course it all dissappeared on Monday but never mind! Up until then I had been solidly wearing birkies or flip flops and my feet were loving it! But now here is the rain – boo hoo! Bring back the sunshine! 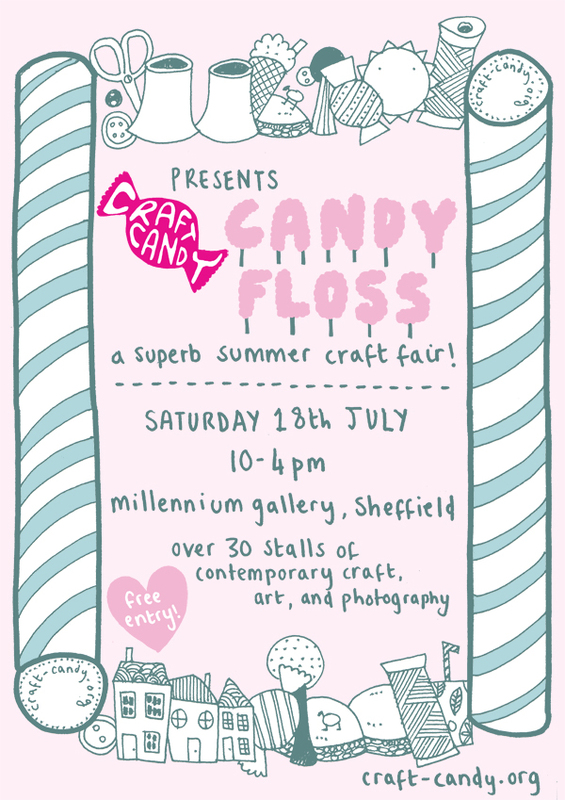 I’ve been busy this week – this weekend just gone was the start of the booking season for Craft Candy’s next fair – Candyfloss! Very exciting all this – I uploaded the new application first thing Sunday morning and we’ve had lots of bookings already! We’ve got a venue swap this time too, we’re going to be at the Millennium Gallery for our summer fair and then it’s back to the Workstation for the Christmas fair in November. Visit our fairs page for more details and to book. Here is our gorgeous flyer which has been designed by the incredibly talented Kate Sutton. I absolutely adore Kate’s work and couldn’t be happier that she’s not only designed our latest flyer but has also done a new logo and other fab illustrations for Craft Candy. We are a lucky bunch of ladies! p.s No news yet on the studio situation – will keep you posted, the closing date for expression of interest was today!